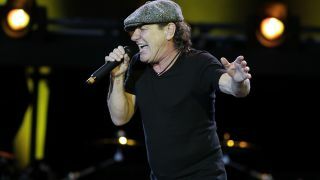 Did Brian Johnson just confirm his return to AC/DC? In August last year, rumours began to swirl that estranged AC/DC members Brian Johnson and Phil Rudd were back in the band. The pair were photographed together outside the Vancouver studio where the Aussie giants recorded their last three albums, and were later snapped with AC/DC’s longtime engineer and mixer Mike Fraser. But there’s been nothing seen or heard since then – but information might now be starting to leak out. Terrorizer say: “We ran into Brian Johnson from AC/DC at the airport today after the flight home and we asked him about the rumours of him being on the new AC/DC album. However, Johnson has since worked with audio experts Asius on a solution to his hearing problems, with Beano taking to the stage following his departure from AC/DC with Muse, Paul Rodgers and Mick Fleetwood.